 Mia's Math Adventure is video game that teaches math.  Nice animations and 3D graphics.  Great way to improve math skills. 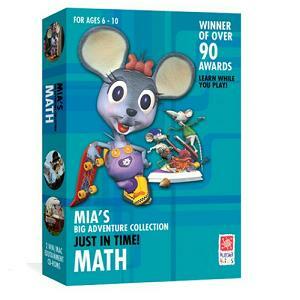 Mia’s Math Adventure (for ages 6-10) is an award-winning video game with beautiful 3D graphics and animations. It contains 4 levels and solid pedagogical content that concentrates on addition, subtraction, multiplication, division, fractions, equations, geometry, multipliers, etc. By playing this video game, kids practice addition, subtraction, multiplication, division. They also learn about fractions, equations and more.